Google Analytics always committed to bringing us new and exciting ways to view and extract value from our data has added a new report. 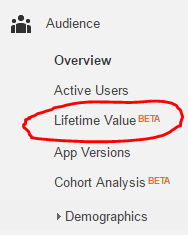 Some users of analytics will now find a beta report named the Lifetime Value report. The Lifetime Value report shows the value of your different users acquired through different channels. The report has been released to certain Google analytics accounts for both in app views and web views. Google explains the "report lets you understand how valuable different users are to your business based on lifetime performance across multiple sessions. For example, you can see lifetime value for users you acquired through email or paid search. With that information in hand, you can determine a profitable allocation of marketing resources to the acquisition of those users." I suspect this report's value is driven by the increase in focus on CRM and personalization by eCommerce stores while the popular subscription model based eCommerce business will also find these reports hugely valuable. What is the lifetime value report? The Lifetime Value report lets you understand how valuable different users are to your business based on lifetime performance. For example, you can see lifetime value for users you acquired through email or paid search. With that information in hand, you can determine a profitable allocation of marketing resources to the acquisition of those users. You can also compare the lifetime values of users acquired through different methods. For example, you can compare users acquired through organic search and users acquired through social, or compare social to email, to see which method brings the higher-value users. Select Audience > Lifetime Value. What prerequisites does the lifetime value report have? You will need eCommerce or enhanced eCommerce tracking activated to populate the report with data. Unfortunately, the report is not applicable for those who use goals/lead forms as their conversion measurement method. What are the measurement ranges for the lifetime value reort? There are two-time elements in the Lifetime Value report. 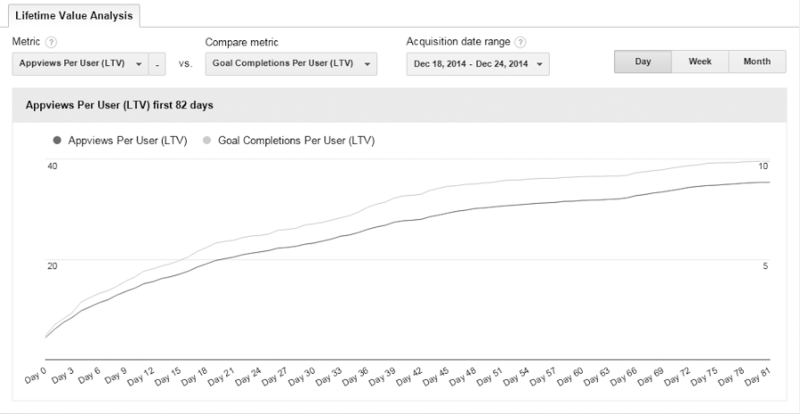 Acquisition date range: Set this date range to identify the date range during which you acquired users. For example, you might want to examine data for users who were acquired while you were running a single-day campaign on Black Friday, or a week-long campaign from December 18 to December 24. This setting establishes the cohort that you’ll examine in the report. X-axis in the graph: Lifetime value is currently a maximum of 90 days. The X-axis of the graph is divided into increments (Day, Week, Month) of that 90-day period, starting with the date of acquisition, which can be anytime during the Acquisition Date Range. The graph illustrates how cumulative metric values change over the users lifetime. What available metrics are in the lifetime value report? What data can I see in the lifetime value report? Where can life time reporting go from here? Where this report will go only time will tell, but it would be great to see lifetime value based on client ID so we can see the cross-device value and cross-platform value. Another valuable upgrade I would personally welcome is data modelling and customer profiling. Being able to model your idea customer and profile users of similar traits and then targeting these potentially untapped and profitable customers would be a welcomed addition to eCommerce sites.